The Grand Rapids Drive made their first appearance in the NBA G League Playoffs this season, thanks to the help of two Native Americans on the roster. One of them, forward Derek Willis averaged 12 points a game. This year was Willis’s first season in the pros and after the way he performed, likely not his last. In addition to scoring in double figures, the rookie pulled in an average of seven rebounds. That effort helped reduce turnovers, and gave Grand Rapids more opportunities to score. Willis suffered a bone bruise in his leg midway through the season, but was able to come back from the injury after a few weeks of recovery. Had he not gotten hurt, though, Willis probably would have led his team to even more wins this season. 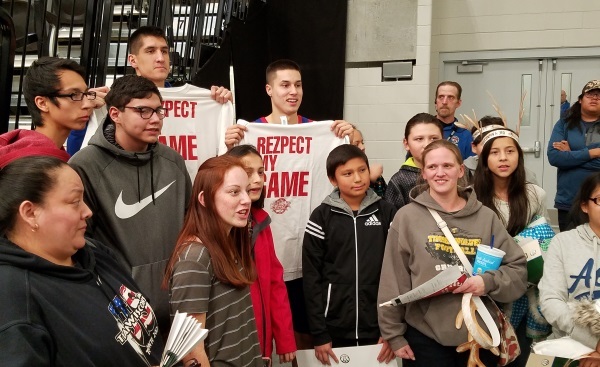 The other Native American player helping Grand Rapids to its first-ever postseason was shooting guard Bronson Koenig, a member of the Ho-Chunk Nation. Koenig made a name for himself at the three-point line, scoring 300 points from behind the arc. Although most opponents never saw him as a triple threat, Koenig’s shooting ability often pulled defenders from the paint and opened up the driving lane for others on his team. First-year coach Ryan Krueger considered that a huge contribution in itself, and said that he would love to see both Koenig and Willis return for another season with the Drive. Grand Rapids lost its first playoff game to the Raptors 905, who would advance to this year’s finals.